Only 10 calves are harvested each year between August 1 and December 31. Reserve your quarter, half or whole Black Angus steer now and we will harvest at the peak date for flavor, dry age it for 21 days, butcher it to your specifications and deliver it to your freezer. If you eat beef, buy the best. It's affordable, locally grown, and you will always know where your beef came from. 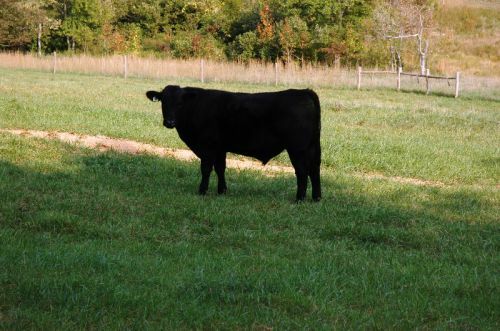 Our locally grown Black Angus steer calves graze on chemical-free, lush Virginia pasture their entire lives and are supplemented with soy-free, Certified Organic peas, barley, corn, alfalfa, sea kelp, and minerals so that the beef we eat is healthy, nutritious, and some of the best beef money can buy. Visit our website at www.waverlyfarmsvirginia.com or call us at 214-914-0323 (Patti's cell) to reserve your 1/4, 1/2 or whole Black Angus steer calf. We are delighted to answer any questions you have and to butcher your share to your specifications after reviewing the options with you. Then, we'll delivery your beef directly to your home in vacuum sealed packages sized for the needs of your family, such as 1-2 lb hamburger, 2 steaks to a package, etc. Did you know that almost all commercially-sold beef was either imported from other countries or trucked from livestock auctions all over the USA to feedlots in the Midwest where they are confined to crowded pens for months, stuffed with GMO corn and other "by-products", injected with growth hormones, antibiotics, and who knows what else until they are doubled in size? Then they are shipped again to commercial butchers where they are dipped in chlorine to rid the carcass of harmful bacteria (standing in feces for months), preserved, packaged, then shipped to grocery stores all over the USA and the world. These practices are accepted by most. But, if you have a freezer you have a choice. Imagine the convenience of having beef you know, at home, in your freezer and available when you want it. Our beef tastes delicious, is tender, and a beautiful red color because it is the freshest beef you can buy. Waverly Farms is a local, family-owned farm in Burkeville, Virginia. We pride ourselves in providing the best forage and soy-free, Certified Organic supplements to our animals. Every animal on our farm ranges freely on chemical-free pasture for their entire lives, is butchered humanely, and cared for using the rigorous standards of Animal Welfare Approved. Half shares yield about 160lbs and cost $7.75/lb. Whole shares yield about 320lbs and are $7.50/lb. This is a bargain as beef is in short supply and auction prices have almost doubled in two years. Typical cuts include roasts, steaks, stew beef, ribs, cube steak, hamburger, soup bones. Some customers elect just hamburger, stew beef and steaks. Others want roasts, ribs and other cuts. Liver, heart, tongue, and other organs and specialty cuts are included or can be excluded. We offer recipes and tips for how to cook the most tender and flavorful meals. For more information, visit our website at www.waverlyfarmsvirginia.com or call Patti at 214-914-0323. Thank you for supporting local farmers!